Take movie snapshots with just one click. Movie2Shot allows the user to take movie snapshots quickly and easily. All you have to do is set your default export settings (rescaled resolution, graphic format, export destination...). 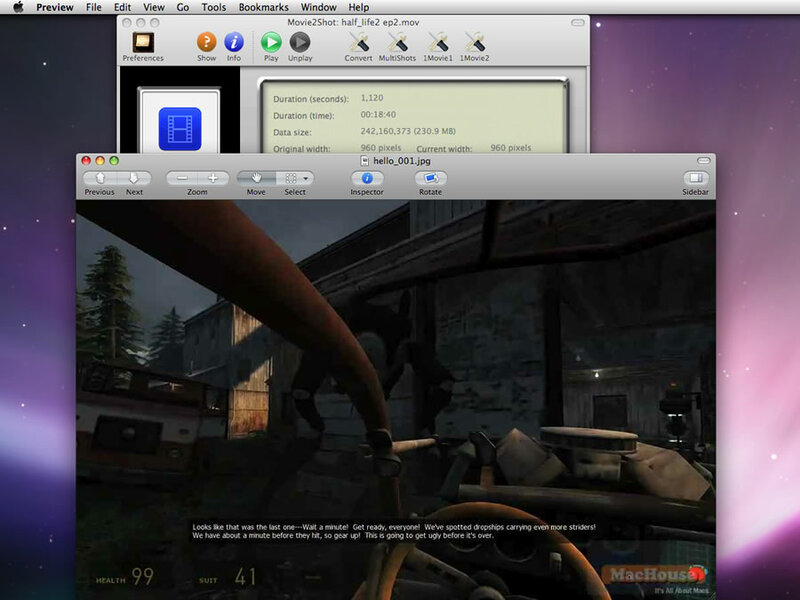 And drag and drop a movie file onto a media drop box. Then scrub the movie and click on the export button or press Command + T. Find another frame and click on the export button. 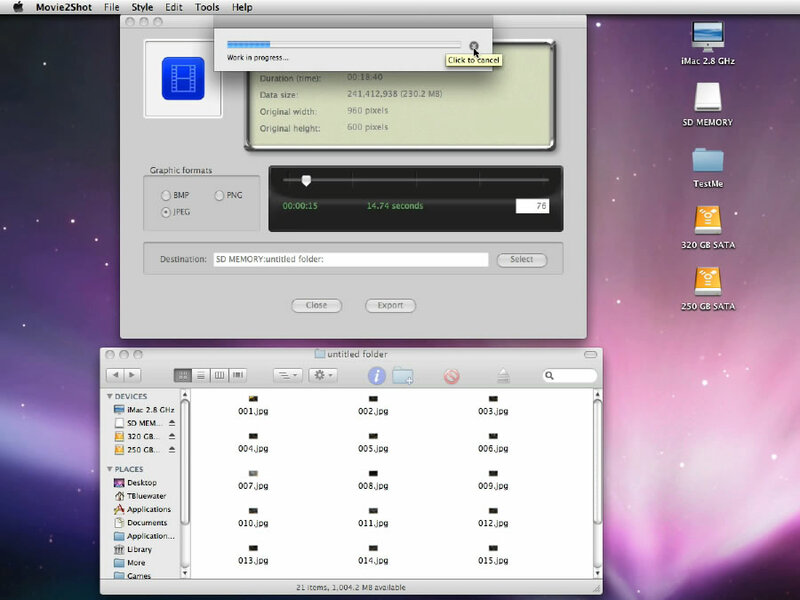 If you are too busy scrubing a movie to export snapshots for yourself, let Movie2Shot do the job automatically. Movie2Shot allows the user to generate movie snapshots in a simple manner like every 30 seconds or every 200 seconds not just on a single movie but also on multiple movie files at a time. Take movie snapshots with just one click. 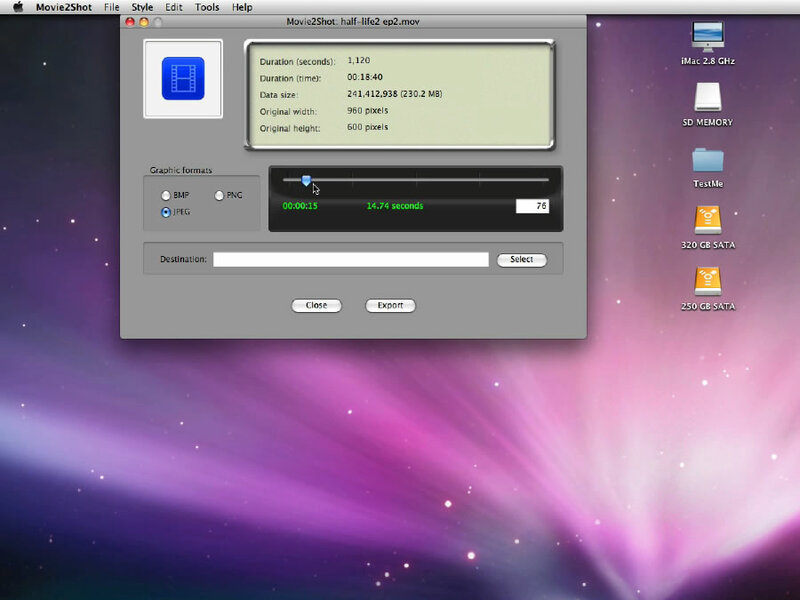 Batch-convert graphic formats on any number of image files for your movie snapshots. Automatically generate movie snapshots on multiple movies simultaneously. Movie2Shot will automatically set the default export path to Desktop when yours goes inaccessible so that you can continue to take movie snapshots. 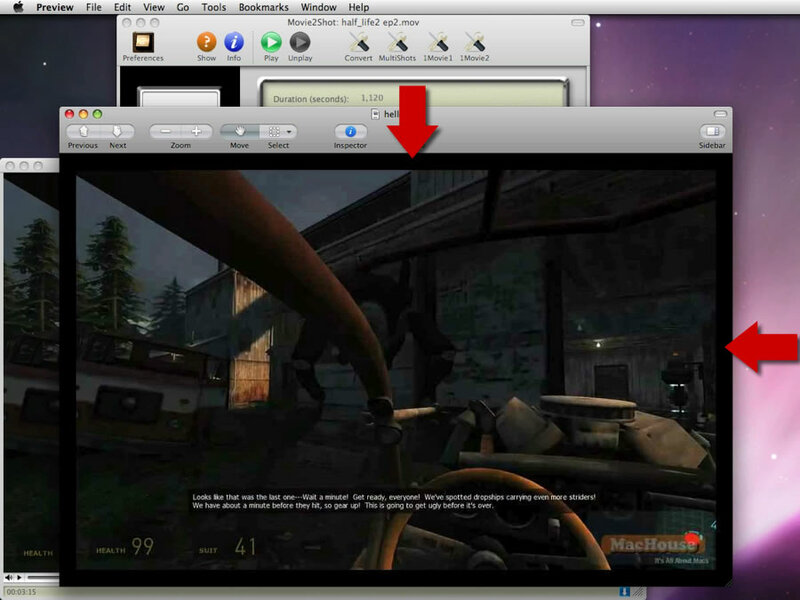 Click on the button to download a demo/trial version of Movie2Shot for Mac. 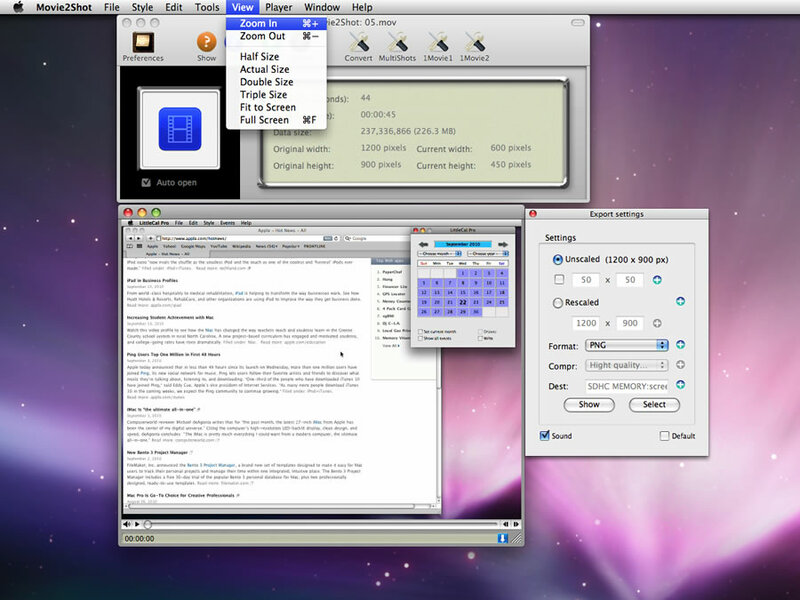 The application is compatible with Mac OS X Lion and available for Intel Mac only. 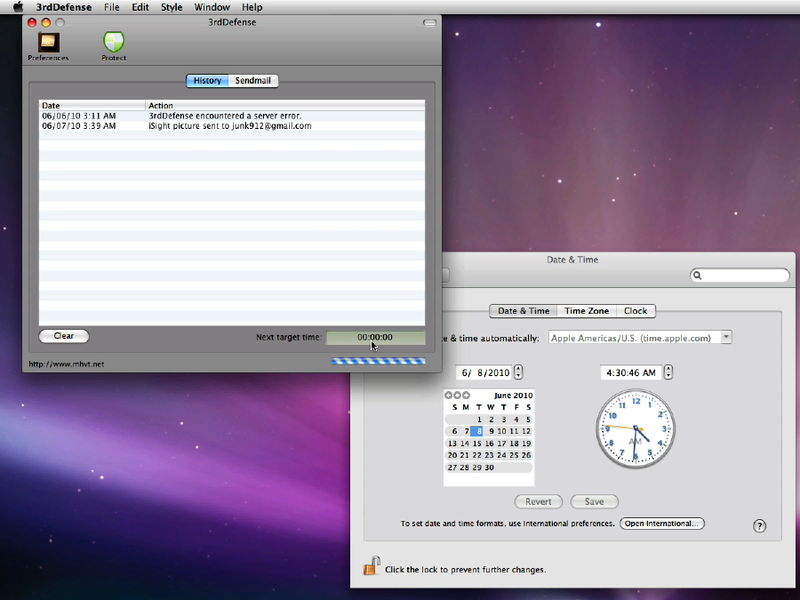 Fix: The application could crash under 1Movie1/1Movie2 when the user pressed the Export button for the second time. Preferences: Enable 'Start with 001,' and the application will skip the first screenshot and instead start with a file named 001 preceded by the file path set by the user. Fix: Clicking on the Resize button over the display window to change movie dimensions could cause some problem. In the meantime, enable 'Lock ratio" to maintain the original aspect ratio. Fix: Clicking on the frame checkbox under under the Export tab of the Preferences window did not let the user enter frame dimensions in the number fields. Fix: After clicking on the frame color button under under the Export tab of the Preferences window to pick a color, pressing Cancel will not set the color (#000000) to black but keep the previous one. The user can now change frame colors right on the Export settings window. Fix: The application could crash when the user quit it by clicking on the close button on the main window while the movie player was open. Fix: The application could fail to analyze the frame rates of the imported movies under MultiShots. Change: The maximum number of possible screenshots the application can generate is increased to 100,000,000 under MultiShots, 1Movie1, 1Movie2. A maximum number of screenshots that the user can generate at a time is extended to 1,000,000. Previously, it was capped at 1,000. 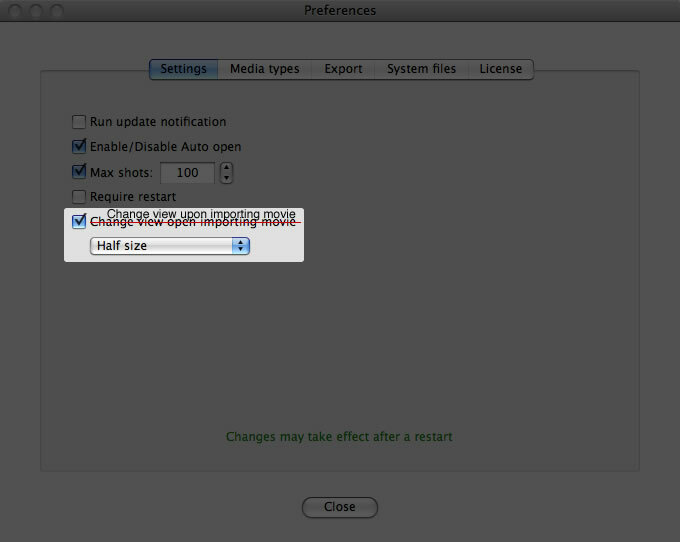 Preferences: The user has an option of whether or not to let the Export settings window following the movie player. Fix: The application could have crashed when the user continuously generated screenshots every second or faster. When the user closes the built-in movie player, the Export settings window will also close itself. All six buttons on the Export settings window are now escapable while the Mouse pointer is away. In order to enhance application's stability, all Preferences settings are stored in an encrypted database. The user must work on Preferences settings from a scratch. We apologize for the change. Click here for more information. Preferences: The user can choose to let the application automatically resize the built-in movie player (half, 2X or 3X) when importing a movie. The application will regenerate missing system files if there are at the time of startup. Fix: The application will reject the media file the user attempts to import if it doesn't contain a video track. Fix: The application will reject the media file the user attempts to import if its duration cannot be determined. Several minor changes and fixes including 2 additional commands under the Help menu are made. 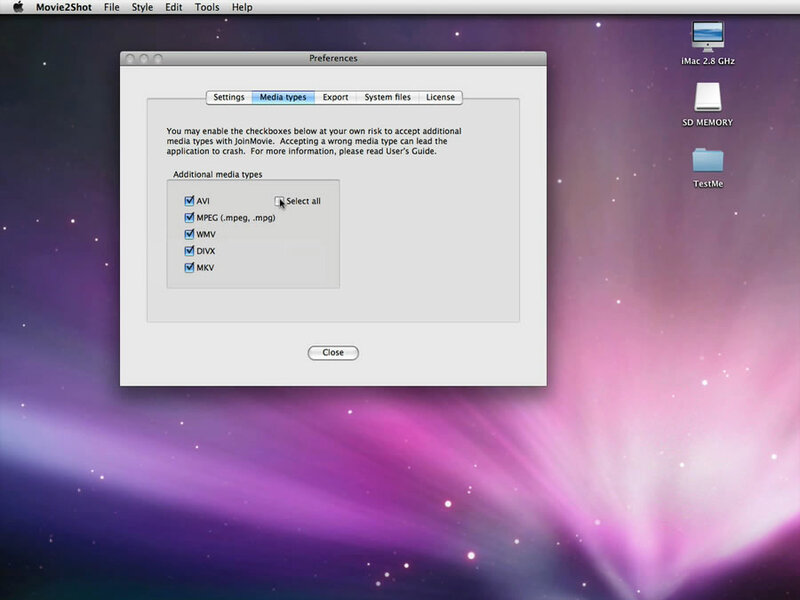 The user has an option of whether or not to restart the application after closing the Preferences window. Convert, MultiShots, 1Movie1, 1Movie2: The destination folder points to user's default one. Convert, MultiShots, 1Movie1, 1Movie2: Some settings are validated in real time, and the export button will remain disabled until they are cleared. Several other minor fixes/changes/improvements are made. 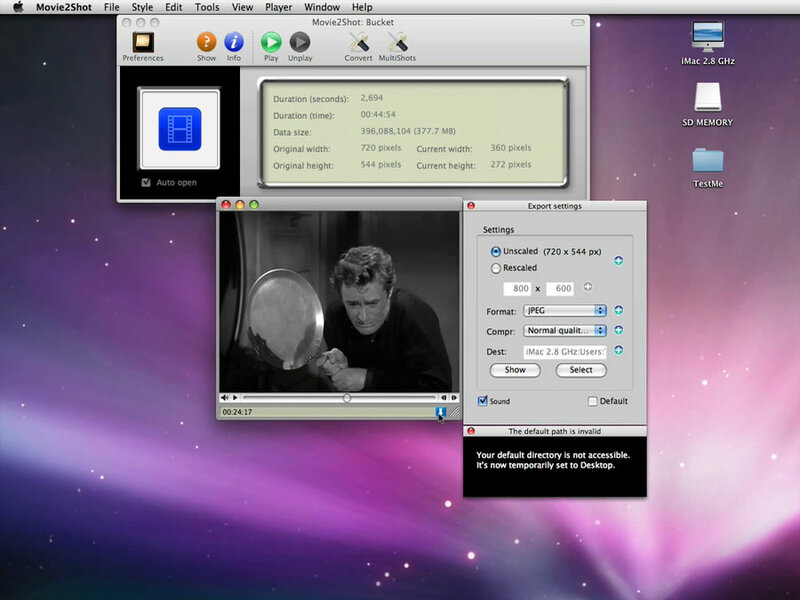 The user is able to set an arbitrary resolution to resize the movie. Fix: Opening Preferences will longer cause the application to make a beep sound. Changes: By pressing the space bar (not space + Shift any more! ), the user is able to stop the ongoing movie. Zoom In (Command plus +) and Zoom Out (Command plus -) are available under View. We wanted to assign Command + 0, Command + 1, Command + 2, ... to Half Size, Actual Size, Double Size..., respectively, just like Apple's QuickTime. (Actually, those shortcut keys are already taken by play speeds.) However, the IDE that we use won't allow it. For now, Command + F is assigned to Full Screen. 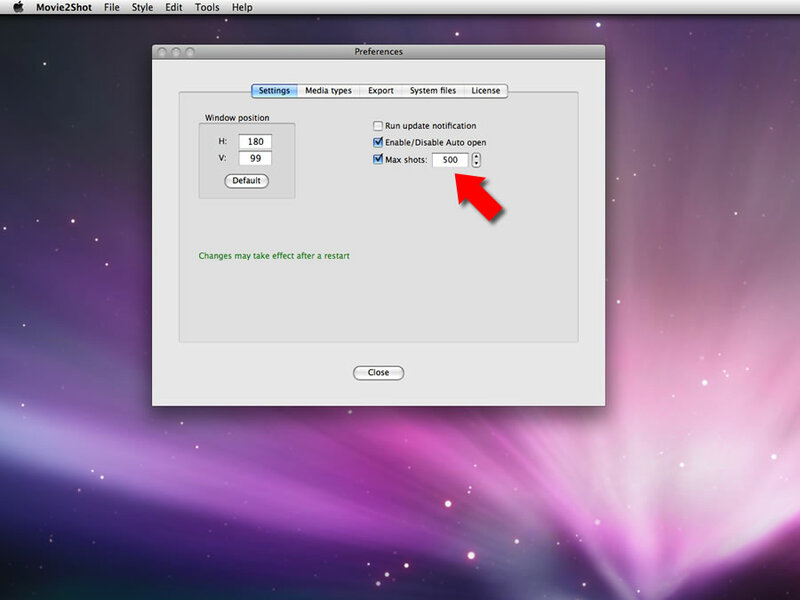 Fix: The export settings window showed hidden controls under Snow Leopard that did not appear under Mac OS 10.5. Several minor fixes are done. Fix: The file extension would not have been correctly set with 'TIFF' selected as an export format. If either the rescale width or the rescale height is invalid, the user will not be able to export screenshots. The rescale with and the rescale height are validated in real time. The user is now able to frame the export screenshot, setting the frame color in Preferences. Click here for more information. 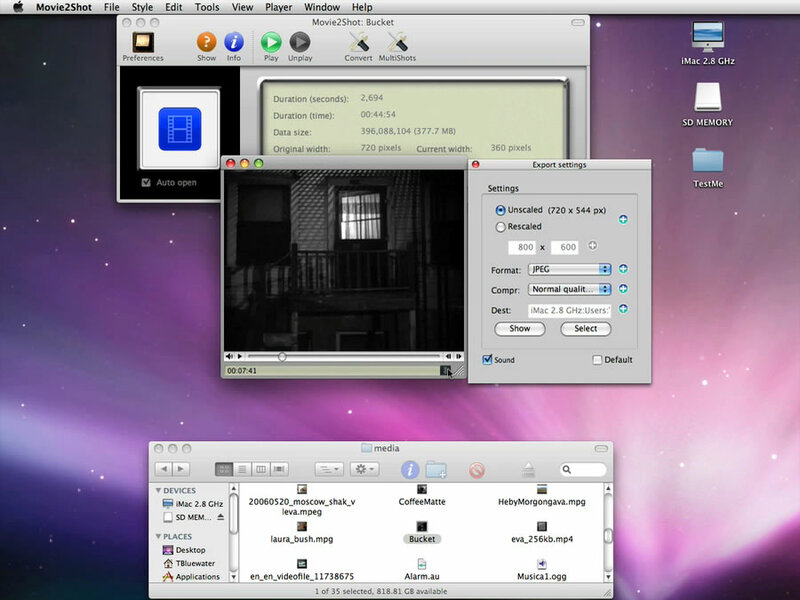 Movie2Shot now uses a different technique to export movie screenshots as the previous method degraded rescaled ones even when the export format was PNG. 'TIFF' is now available as an export format. Fix: 1Movie1 (formerly, 1Movie) - The interval (the number of seconds) will not end with a decimal point. Show info button is available for 1Movie1 (formerly, 1Movie). Clicking on Show info, the media window will open. A new tool is available. 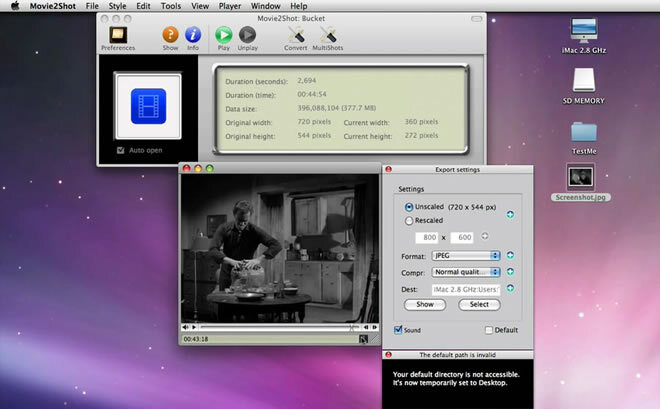 1Movie2 allows the user to generate a specified number of randomly-selected snapshots out of 1 imported movie file. The maximum number of snapshots can be set in the Preferences. A new tool is available. 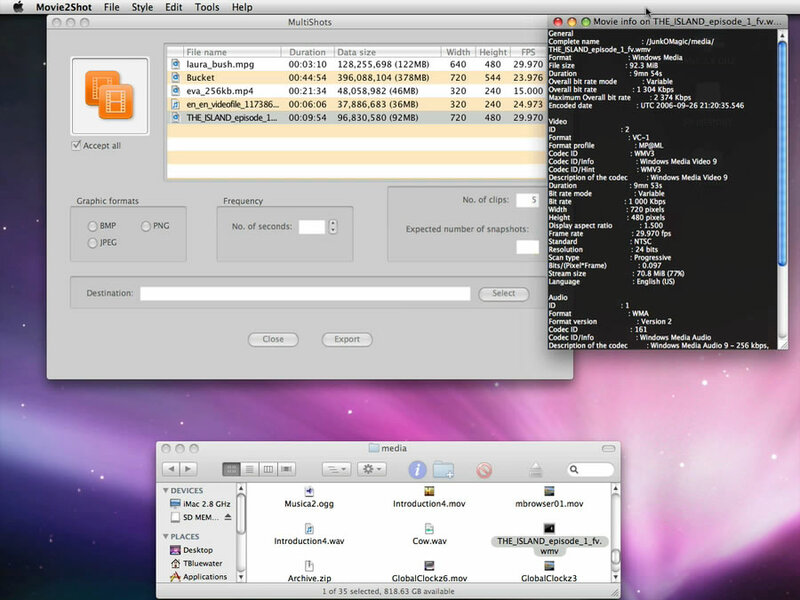 1Movie allows the user to generate a specified number of snapshots sequentially out of 1 imported movie file. Click here for more information. Just a minor typo fix... We will soon release another minor fix version. Movie2Shot now supports 'drag & drop open.' Dragging and dropping a movie file with the following file extensions onto the application icon will cause Movie2Shot to launch itself, reading the file. Previously, exported files were automatically named with user-defined default file name plus an underscore plus a 3-digit number. 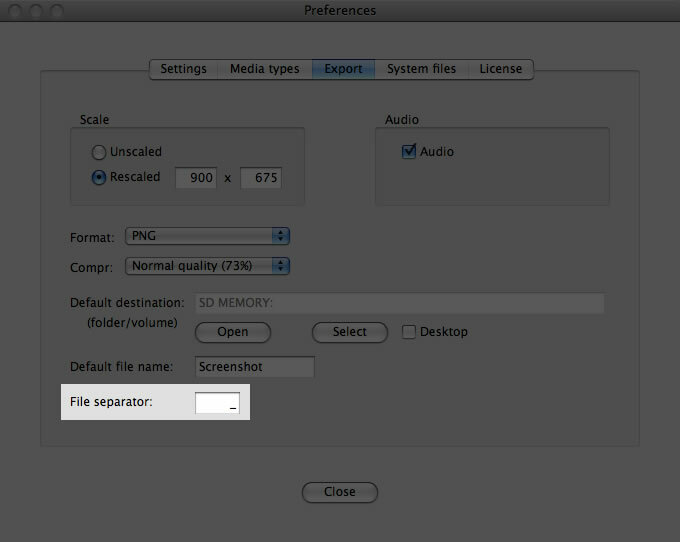 This update allows the user to set a file separator under Preferences > Export. If no file separator is specified by the user, Movie2Shot will automatically insert an underscore between user's default file name and a 3-digit number. Pressing Command + W will close the movie player if it's open with a movie. The warning window that alerts the user of inaccessible default export path will close itself after the user saves a new path on the Export settings window. Previously, clicking on the save button let the application save default file name changes, not changes in the path to the export folder. A fix on the progress window with MultiShots where clicking on the cancel button caused the process to bounce back and show some progress again before shutting the entire process. Opening Preferences will cause the application to close the movie player. Movie2Shot is a product of MacHouse.